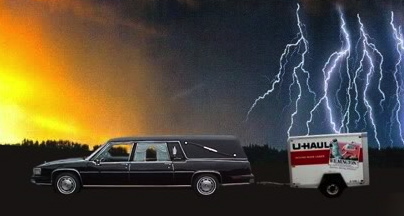 What we take to Heaven is not going to be in a U-Haul. Cherish our Blessings and what is Really Important. I did not pay to watch the fight last night between Mayweather vs Pacquiao, did not see the rationale in spending $99 for pay-per-view, but plenty of people did. It is projected that between the two fighters they will earn a combined total of $180,000,000. Whether it is a fighter, an athlete, an actor or any other profession whose income is determined by the willingness of people to watch them perform, I say fantastic. That is Capitalism and how a free society is supposed to work. Everyone should have the ability to earn what they can if people are willing to pay for it. The Federal Government should receive about 72 Million in Taxes if all the rules are followed. The fighters will keep a nice sum and the government should also receive a nice sum for one evening of work. If our Tax system is going to work and our government is going to earn back the trust of our citizens then here is a wild crazy thought. Pick a city, any city..even Baltimore that is going through lots of tension and unrest. Pick any city in the country that has a homeless, unemployment situation. Of the 72 Million in taxes a facility can be built to house homeless, especially those with children. Use 50 million to build the facility and put the other 22 million in the bank. At 3% interest 22 million will earn $360,000 a year. So what can this accomplish? We could have a major city that no longer has Homeless or Hungry Children. Or at least reduce it by a huge amount. The interest every year can support a staff, the operation of the facility and programs to teach and re-train those that want to get off welfare and earn for themselves. The problem is we don’t have politicians that look at the big picture just the same thought process over and over. Just think, between other fights or events that generate big income/taxes how much of this country’s domestic problems can be fixed..if only we had a Gov’t that was responsible with money…we can only hope.